On the first Sunday of June, June 2nd, a special benefit sale was held in the Parish Hall at St. Henry's. However, the date didn't prove to be a good one for the sale, as there was no 9.45 Mass because of the Corpus Christi celebrations (see photos here), so a second sale was held on October 13. A third and probably last sale will be arranged a ta later date; when the date has been settled, we'll update this page again. This time there are new items for sale, among them a washing machine, a fan, a 120-centimetre long oval glass table and four smaller glass-top tables for sale! Come and look for bargains! 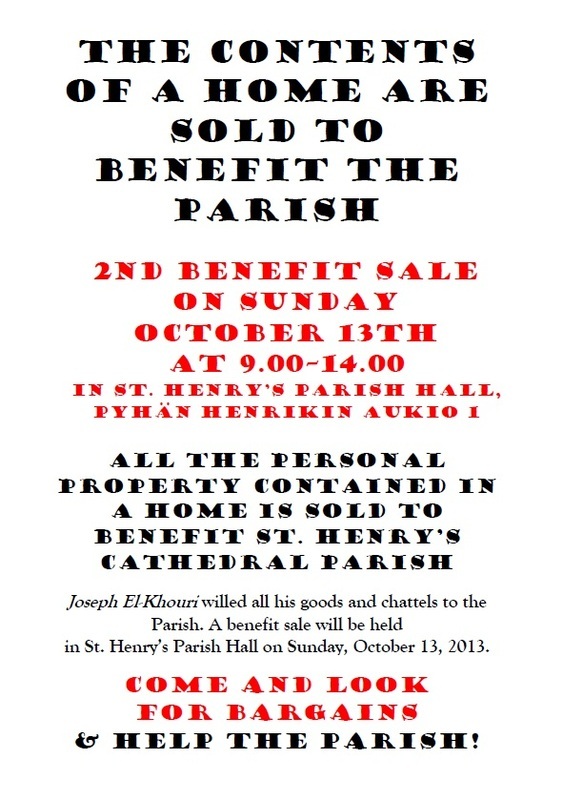 The special sale is arranged because Joseph El-Khouri willed the contents of his home to be sold to benefit the Cathedral Parish. New pdf's will be posted on this page when the date(s) for the autumn sales have been settled. Below you will find posters for the October sale. The English version is also visible here as a picture file.